Palak Jain and Tapasvi Mehta tied the knot this weekend in Indore amidst close friends and family. We have been constantly sharing all the details about their marriage and pictures from the occasion. Now, here we are, with the pictures of their reception. Celebrities including Manav Gohil, Shweta Kwatra, Kunal Jaisingh, his wife Bharati, Rohan Shah were some of the Telly stars who made it to the guest list. 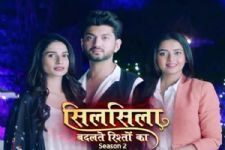 Palak will be seen in ALT Balaji's web-series Kehne Ko Humsafar Hain 2, has been dating actor Tapasvi Mehta since a long time and the couple finally took their relationship to the next level. Earlier, sharing about her plans on marrying in Indore rather than Mumbai, the actress revealed to a leading daily, "I could have got married in Mumbai, but I have my own reasons for choosing Indore. Firstly, it's my hometown and secondly, I want people to take two days off and consider it a short holiday. I don't want them to stress about work. I have always dreamt of a fairytale and elaborate wedding. So, I will have every possible function leading up to the D-day. There will be a pre-wedding celebration on January 28 in Mumbai for my industry friends and family. The haldi, mehendi, and sangeet will be held in Indore on February 7, 8 and 9, respectively. I am excited about getting married in the month of love, and we will take off to New Zealand for our honeymoon." And it's a working birthday for THIS Silsila Badalte Rishton Ka 2 actress! #Exclusive: Beyhadh fame Aneri Vajani in Colors Kitchen Champions? Kunal jaisingh rocks so lovely all pic.. Lots of love . And we wish the actor a very happy birthday!